An interview with former fundamentalist, Ed Suominen. Ed Suominen was raised in a small sect of Lutheran Christianity called Laestadianism. Of the 32,000 denominations into which Christianity has fractured, his is one of the more conservative. Members believe in the literal truth of the Bible, including the creation story. They eschew sins like drinking, dancing, watching television, wearing earrings, and playing school sports. They marry only within their own sect and believe God alone should decide how many children they have. Suominen followed the rules; he met and married the right kind of girl; and together they have 11 children. It was the beginning of the end. After discovering the practical value of evolutionary computation, Suominen began reading about evolutionary biology. The Genesis story fell apart and frayed the fabric of his Christian belief. Outsiders sometimes scratch their heads about the dogged insistence of creationists that Adam and Eve actually existed 6000 years ago in a perfect garden without predators or pain, until they took Satan’s bait and bit into a world changing apple. How is it, 100 years after Darwin, that we are still fighting about what will get taught in biology classes? Why, in their determination to refute evolution, do some Christians seem intent on taking down the whole scientific enterprise? The answer lies in Suominen’s lived experience. As he puts it, “You don’t have Original Sin without an original sinner. And without Original Sin. . . you don’t need a redeemer.” In other words, the central story of Christianity, the story of a perfect Jesus who becomes a perfect human sacrifice and saves us all relies on the earlier creation story. After evolutionary computation cracked the walls of Suominen’s information silo, his curiosity and training as an engineer took over. He spent the next year consuming books about Christianity, books by defenders of the faith and by critics. He wrote about his spiritual journey in a series of musings now published under the title, An Examination of the Pearl. In this interview he discusses his life-changing journey. Your book is about evolution, both biological and personal. You’ve been through a change in worldview that most people can only imagine. Does it feel disorienting? Yes, it’s a tremendous change. But I feel much less disoriented than when I was battling cognitive dissonance every day trying to maintain a coherent worldview out of pieces that just wouldn’t fit together. I’d come home from church on Sunday and spend hours or even days trying to recover my intellectual integrity. One part of my brain would continuously play the ominous soundtrack from my childhood indoctrination, repeated in church every Sunday: Believe or be damned. Meanwhile, another part would list off the hundreds of issues that made “belief” impossible and dishonest. And evolution with all of its theological dilemmas headed up that list. It’s wonderful to be able to stand up and look over that toxic fog of piety and just see, accepting reality for what it so clearly is. I am happier now than I ever was in the church, despite the social loss of leaving it. Do you ever find yourself wishing that you’d never opened Pandora’s Box? My old church had its annual nationwide summer services right near our home this July. Here I was, within 20 miles of a gathering of around 2,000 members of “God’s Kingdom,” which considers itself the only true church on earth. There were people I’d grown up with, people I’d been with in the pews and on camping trips for my whole life. They stayed in their place, and I stayed in mine, an outsider now. I certainly felt some pangs of longing. But it was only about the people, not the institution that envelops and controls them. When I listened online to the sermons preached during those services, I wondered how I’d ever taken any of it seriously. One was all about Noah and the Ark, and how God’s patience had run out when believers started intermarrying with people from “the world.” It’s an ancient myth copied from the Epic of Gilgamesh, and this guy is sitting there doing a gross misreading of the text while taking it all very literally otherwise. The story itself is so ridiculous that many people in the church don’t really buy it. Yet it’s one of those things that you really are expected to believe—the Bible is God’s Word, not to be questioned. How have your eleven children and wife responded to your changes? While I was still wrestling with all this, my wife turned to me one Sunday morning and said, “I know this is how we were raised, but I’m not buying it anymore.” She had been doing some reading, too, and that was that. I had to study and ponder and write, even for a while after she made her quiet, no-nonsense departure from the church. She is a wonderful, bright woman whom I love and admire very much. I respect my children’s privacy too much to talk extensively about their beliefs or lack thereof. That’s their business. But I will say that they seem to all be doing just fine with the changes in my wife and me, from the oldest to the youngest. Our home is a place where they can be free to think and believe, or not believe, for themselves. Would you say you lost your faith gradually—or might you describe it as a series of plateaus, punctuated equilibrium? Then there was the upsetting day when I spoke with a preacher whom I respected (and still do) after sharing with him some of my thoughts about evolution. I asked him if I really had to reject human evolution and believe in Adam and Eve to be a Christian. He was thoughtful about it, but his response made clear where I stood with respect to the faith we both held dear: Yes, the Fall of humankind in Eden is a foundational point of Christian theology. I wandered around in a daze for a while, sad and scared, but realizing that he had only told me what I already suspected. I enlisted my friend Robert M. Price to see if there was any plausible theological solution. Dr. Price had been serving as a sort of spiritual therapist for me, helping me deal with the issues I’d been finding with my religion once evolution had “cracked the walls of my information silo,” as you adeptly put it. At this point, our work together turned into a full-blown writing project, and together we plowed through books by Francis Collins, John Haught, Kenneth Miller, and others who claimed to make sense of Christianity in view of evolution. But to us, despite trying to approach the theology with an open mind (which Price does even as an atheist), the only thing sensible about their books were their eloquent defenses of evolutionary science. Most creationists seem pretty adept at deflecting the evidence for evolution. Why did it get you? You don’t have Original Sin without an original sinner. And without Original Sin. . . you don’t need a redeemer.I saw it happening right in front of me on my computer screen. As an engineer with lots of software experience, I understood what the computer was doing. Simulated organisms were evolving remarkable abilities to move, swim, etc., and nobody was designing them to do that. Random mutations and genetic crossover between the fittest individuals in the population produced a new, slightly more evolved population. Repeated over hundreds of generations, it worked. My reading did nothing but confirm this. All of the arguments I saw against evolution were made by believers in defense of their faith. I tried to look at both sides of the story, but it became obvious that there was only one side with any credibility. The other was just wishful thinking and denial. 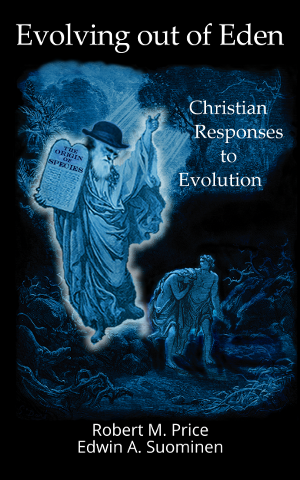 Out of all of the ways in which believers have tried to reconcile evolutionary biology and the Christian tradition, which seem to you the most robust or credible? The most robust attempt to reconcile the irreconcilable may well be Philip Gosse’s “omphalos” idea that the universe was created recently with the appearance of great age. Of course God created Adam with a navel and trees with rings! They wouldn’t be recognizable without those “retrospective marks,” after all. (Christians are faced with the same issue concerning Jesus and his magic Y chromosome.) It’s ridiculous and reduces God to a cosmic cosplayer, but at least it doesn’t try to dismiss all of the Bible’s clear teachings about a young earth and special creation, or fancifully reinterpret two thousand years of Christian theology. Your story makes people feel hopeful that change is possible, that individually and collectively we can change and grow. What should people who are invested in science and progress say to creationist friends and family members? Anything? The stakes are too high to expect much rational deliberation of the evidence, I’m afraid. For me, the evidence of evolution snuck in the back door when I wasn’t looking. Perhaps the best thing to say to creationist friends and family is that you understand why they believe so strongly, and that you’ll be happy to help them whenever they might wish to look beyond those beliefs. The first and most productive step might be getting them to acknowledge, to themselves at least, that religion is the real motivation for every single argument against evolution.